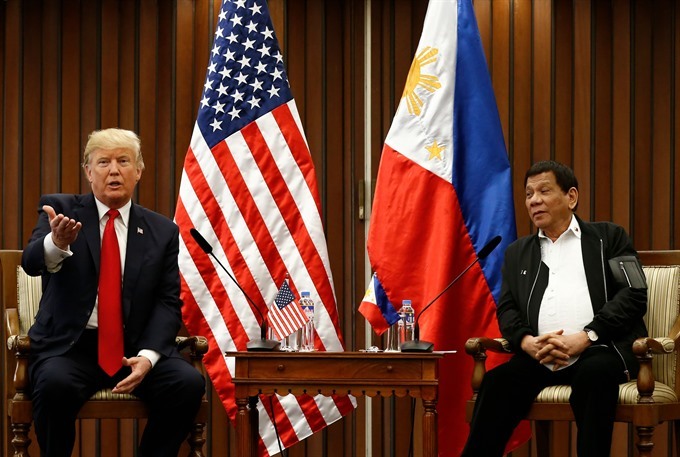 MANILA — Donald Trump declared on Monday he had a "great relationship" with Philippine President Rodrigo Duterte, as the leaders joked with each other in Manila. Rights groups had called on Trump to end his Asian journey with a strong statement against Duterte’s drugs war, which has seen police and suspected vigilantes kill thousands of people. But Trump and Duterte had a series of encounters on Sunday night and Monday morning in which they appeared to enjoy each others’ company, leading to warm praise from the US president during official talks at lunchtime. "We’ve had a great relationship. This has been very successful," Trump told Duterte in brief opening remarks at their meeting. "I’ve really enjoyed being here," he said. As the reporters were being escorted out of the room, one asked if Trump would raise the issue of human rights, to which Duterte jokingly called the media "spies", and neither answered. Duterte’s spokesman later said the meeting lasted for more than 40 minutes, and that Trump did not raise any human rights concerns.